Home » Nature Photography » At First Light! Arise early and the world is far more glorious! As you get older, they often say you naturally wake up earlier. For me, I get up early because I know that the times near sunrise are some of the most spectacular and should not be missed. And what a great way to start any day! This view lasted for only seconds. To capture it, we have to quickly pull over on the side of the road out of harms way, grab the camera, use Liveview to get a quick setting, hold steady (including holding our breath) to minimize camera shake, and press the shutter. 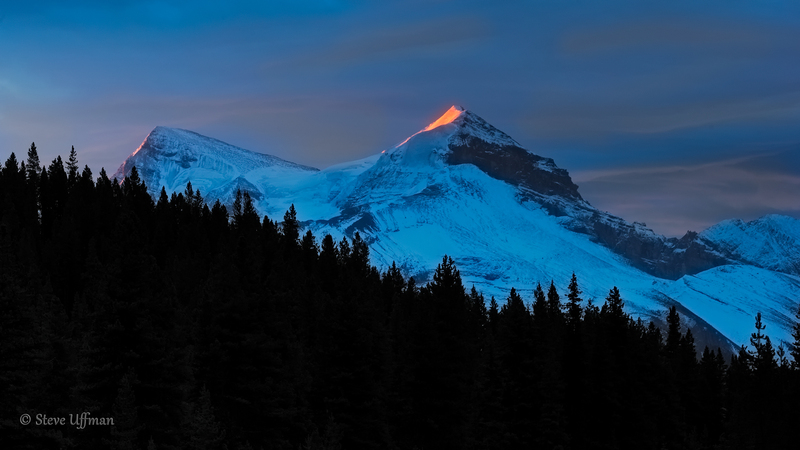 A tripod and long exposure were out of the question only due to the fact that we knew the magnificent light on the mountain crest would last only seconds. Sure enough this magical moment disappeared as fast as it appeared. Nevertheless, we were so happy we were there to capture the wonder of it all. For those that would sleep in to grab the few extra winks, well I will leave it to you to decide whether the trade off is worth it. — in Jasper, Alberta, Canada.